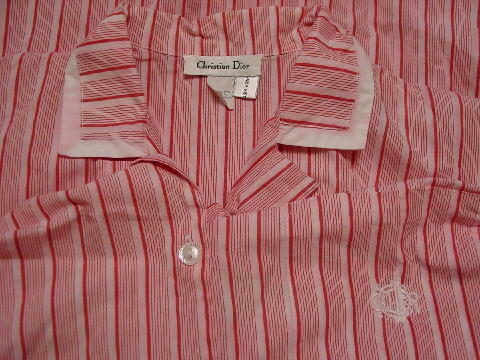 This red and white striped nightshirt is by Christian Dior and was sold at Saks Fifth Avenue and is 100% cotton. 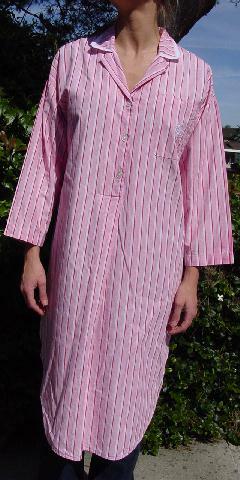 It has 3 textured white buttons down the front and a left breast pocket with an embroidered Christian Dior logo on it. The tag says hand wash separately in warm water. Someone didn't follow the instructions and the red dye bled onto the white collar edges, on part of the embroidered logo, and on the white stripes. 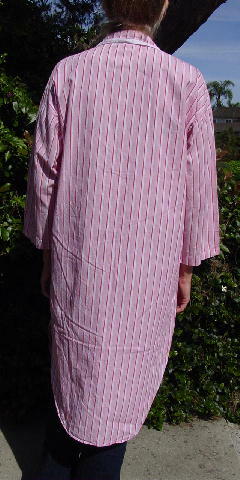 The rounded bottom edges go upward 8 3/4" to the side seams. It was worn in a movie wth the "bleeding" on the white areas.